Most commercially available salmon is farmed Atlantic salmon (Salmo salar), one of several species from the family Salmonidae. Salmon are anadromous, being born in freshwater, migrating to the ocean as young adults and returning to freshwater to reproduce. 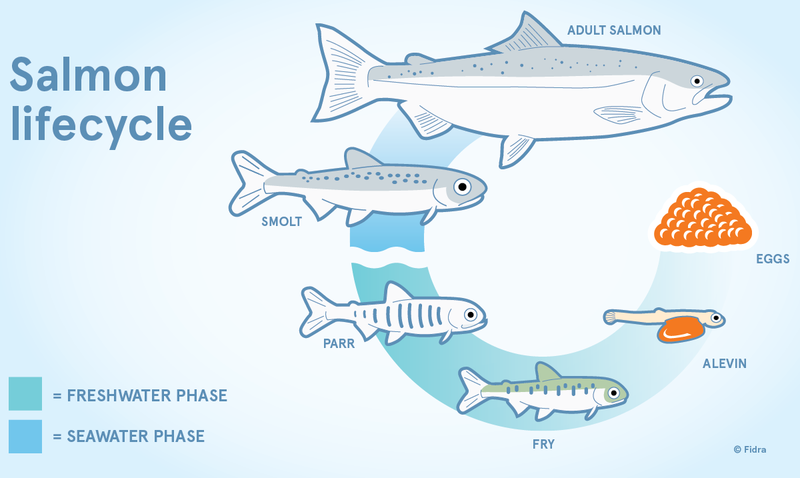 The juvenile freshwater stage of Atlantic salmon (Salmo salmar) takes 24-36 months in the wild, and 6-12 months in farms, developing from egg through the alevin, fry and parr stages to the smolt stage which can then move to saltwater. The alevin stage is very small, <2.5 cm, and has a sac containing the remainder of the yolk which they feed on. The yolk sac is slowly absorbed over time, following which alevins will “swim up” in the water column, showing readiness to first feed.Eggs are obtained from specialised suppliers (commonly based in Norway or Ireland), which remove eggs from broodstock selected from seasite production stocks. The eggs are laid down in trays or silo systems. After 25-30 days fertilised eggs show “eyes” and unfertilised eggs are removed by a process called “shocking”. They can take 2-6 months to hatch.Once a young salmon has absorbed its yolk sac it is called a fry. This is a rapid growing stage.Salmon fry that reach a length of 6.5 cm (2.5 inches) are called parr. The parr develop camouflaging vertical stripes. Vaccinations are given at the late part of this freshwater stage at 30-40g weight.‘Smoltification’ is a complex developmental transformation, involving physiological, biochemical, morphological and behavioural changes which allows young parr salmon to transition from living in freshwater to living in saltwater. Light and temperature regimes can be manipulated artificially to induce early smoltification. Smolts are initially 12-15 cm (5-6 inches) long, 50-80 g and distinguished by bright silvery colouring with scales that easily rub off.At around 100g smolt are moved from freshwater to sea water, where they develop into the adult salmon stage. On farms it takes 14-24 months to reach a full-size adult. In the wild the salmon return to their natal river after 24-36 months to spawn. There has been a trend to keep smolt size (post-smolt) before transferring to seawater, from between 100 to 1000 g.
The average size of an Atlantic salmon in the wild is 71-76 cm (28-30 inches) long and 3.6-5.4 kg (8-12 pounds) after two years at sea. Adults can grow to be 13.6 kg (30 pounds). Harvest size in farms is about 4.5-5.5 kg.